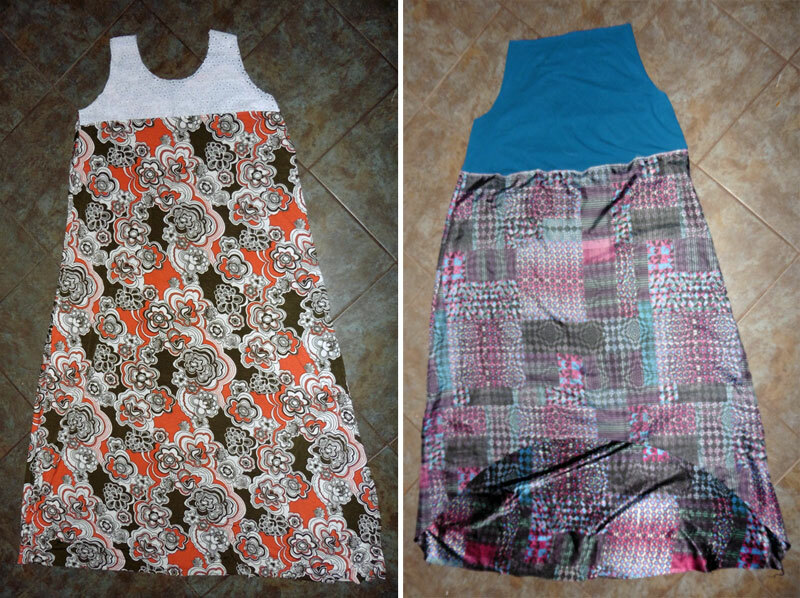 California Dress & Peplum Sew Along: Day 1 – Everything Your Mama Made & More! 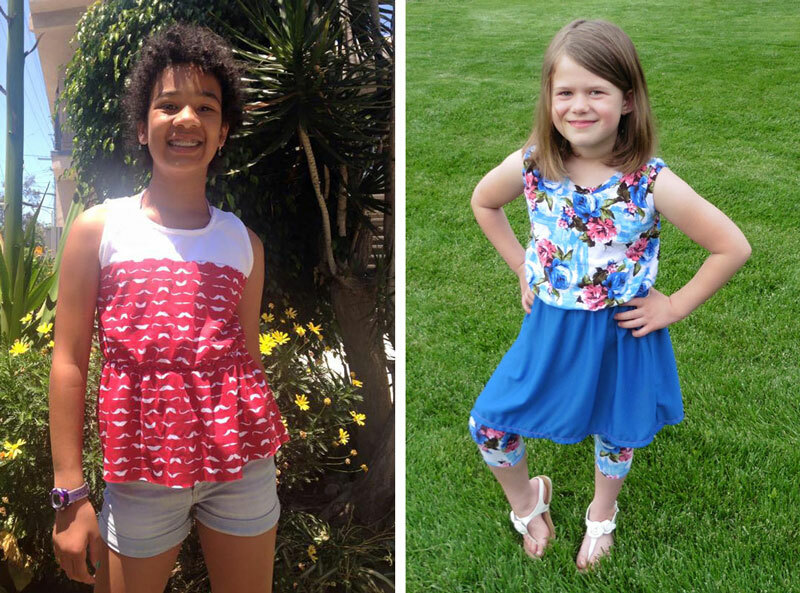 After the California Dress & Peplum (women’s, girl’s, and the bundle) was chosen for June’s Manic Monday Flash Sale, Kymy and I spontaneously decided to do a sew along this week. I love that all the options included let you make many different versions of the California! I’ve sewn both the girl’s and women’s versions many times. 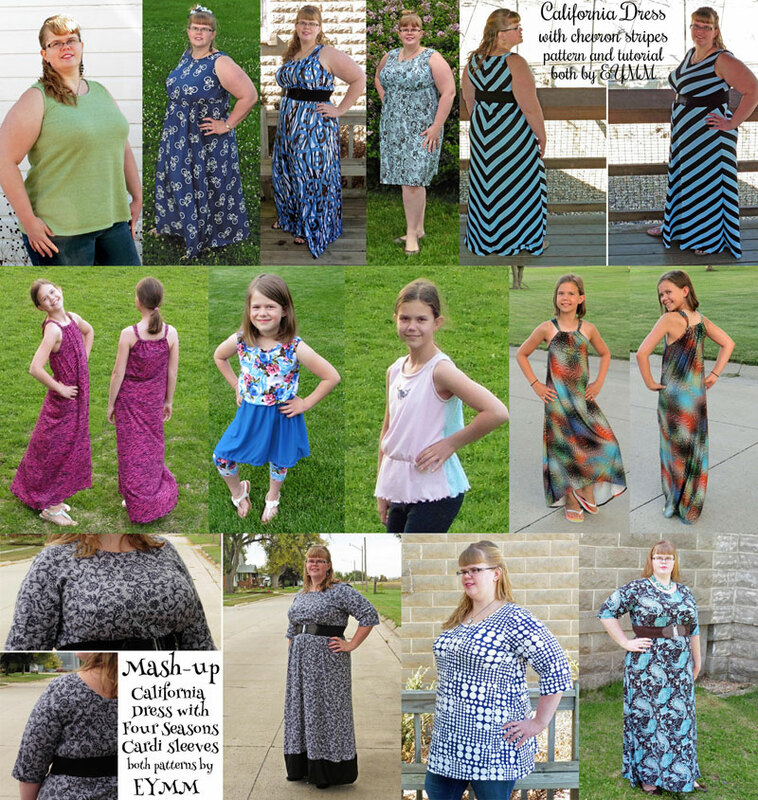 I’ve even mashed the California’s scoop neck bodice with the Four Seasons Cardigan sleeves (find the tutorial here), as pictured in the bottom row of the following collage. 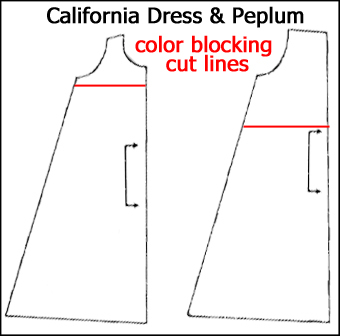 So … with all that covered … Welcome to Day 1 of the California Dress & Peplum Sew Along! First things first, you need to decide which size to sew based on full bust measurement (if you’re uncertain, click here for a post about bust measuring) and you’ll need to choose your fabric. If your measurement falls between sizes and you’re using knit fabric, you can choose to size down for a closer fit or up for a looser fit. If you’re using woven (like I did here and here), I recommend going with the bigger size. My bust measures 1/2 inch below size 2x and I definitely need to use a 2x for woven but I prefer 1x for knit. 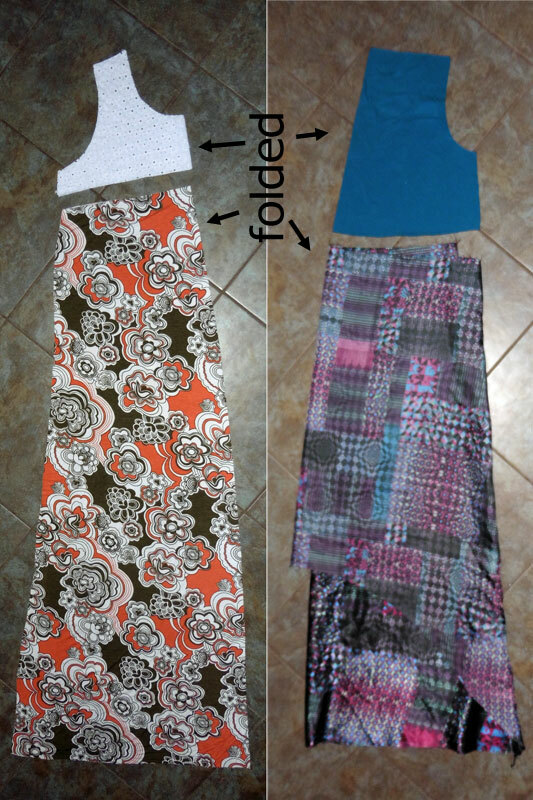 Next, you’ll need to print and tape together your pattern and choose which of the two bodice and multiple hem options you are going to use, then trace or cut your pattern pieces. I like to trace (or fold, if not using the hi-low hem) so I can keep the other hem options intact for later use. Because of the way Kymy drafted the California, you can choose to use either the scoop neck bodice or the faux halter bodice for both front and back of your dress/peplum or you can use one of each! I will be making a floor-sweeping version with the scoop neck on front and back and I’ll also be sewing a hi-low version with the faux halter for both front and back. Now, I mentioned color blocking and now’s the time to decide if you want to color block your California. To color block only the upper chest (pictured above on the scoop neck version), you’ll want to cut (or fold) your pattern straight across about one inch below the armscye. When you cut your fabric, add 3/8 inch for seam allowance to both the top and bottom pieces along the color block cut line. I’m choosing to only color block the front of my dress, so I cut my back all one piece. Feel free to use lace, eyelet, or another coordinating woven (or use another knit) for the top piece. To color block at the elastic waistline (pictured above on the faux halter version), you’ll cut (or fold) your pattern on the dashed waistline included on the pattern. Again, when you cut your fabric, you’ll need to add 3/8 inch for seam allowance along the color block cut line to both the top and bottom pieces. For my dress, I’m color blocking both the front and the back (and using the hi-low hem). I chose to make a knit bodice to go with my slippery/ satiny woven skirt (remember last week when I mentioned salvaging that second dress that I cut too small? Here’s the skirt portion!). Don’t forget to cut out your scoop neck and armscyes bindings, which should be cut from knit fabric. If you’re using two scoop bodices, you can double the length of the scoop neck binding and just cut one rather than cutting two the shorter length. If you’re sewing the faux halter, don’t forget to cut out your neck strap (if using two faux halter bodices, you can double the length and just cut one rather than two). Now that everything is cut out, we can start sewing! If not color blocking, skip to step 3. Step 1: To color block the upper chest, place the top and bottom pieces right sides together, matching the center and sides. Pin and sew with 3/8 inch seam allowance. Step 2: Turn right side up, press the seam allowance down toward the bottom hem (so it won’t show behind your lace) and top stitch to hold it in place. Step 3: Place the front and back right sides together and sew down the side seams from the armscye to the bottom hem. If you’re making the faux halter, you’re done for today! If you’re using the scoop neck for front AND back, you also want to sew the shoulder seams before being finished for the day. Check back tomorrow for details on applying the binding to the scoop neckline and armscyes and/or to finish the top of the faux halter!